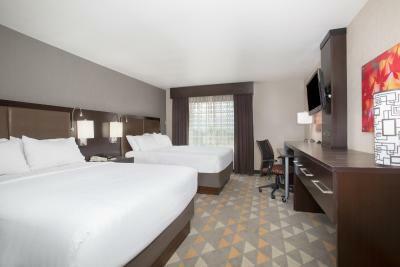 Lock in a great price for Holiday Inn Colorado Springs - Airport – rated 8.3 by recent guests! Everything was fine except for the front desk receptionist. I loved how spacious the room was.! Specially the bathroom, can’t forget the mirror with the light.! The GM was wonderful and all the staff made my wife and feel really special , Im a Marriott employee and was so Impressed with the staff . The front desk was amazing also , it was my birthday and it seemed as if everyone knew it. AMAZING !!!! The staff was very friendly! The room was exactly what we asked for. Had an indoor swimming pool which we enjoyed with a hot tub. We loved the location and the staff was very helpful. They were very accommodating to their guests. We really enjoyed our complimentary breakfast and the staff of the restaurant were very accommodating as well. Staff was very pleasant! The wait staff in the restaurant was as well! The what seemed effortless ease of booking room on booking.com. It definitely came at price, and additional fees that were not necessary, call your hotel directly, the extra fees were not needed or wanted. Holiday Inn Colorado Springs - Airport This rating is a reflection of how the property compares to the industry standard when it comes to price, facilities and services available. It's based on a self-evaluation by the property. Use this rating to help choose your stay! Offering free shuttle services to and from the Colorado Springs Airport, this Holiday Inn features a heated indoor pool and a hot tub. Free breakfast is served daily. Garden of the Gods is a 20-minute drive from the property. 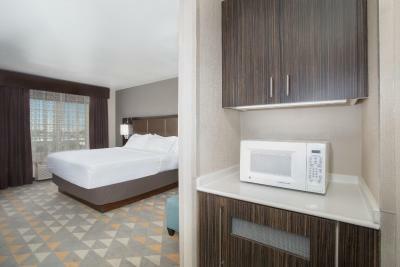 Rooms at the Holiday Inn Colorado Springs – Airport are equipped with free WiFi, a flat-screen cable TV and a microwave and a refrigerator. A private bathroom is also offered. The Sporting News Grill, an on-site restaurant and bar that serves American cuisine. Guests of the Colorado Springs Airport Holiday Inn are welcome to enjoy the on-site fitness center and the business center offers a public use computer, faxing and printing services. Holiday Inn Colorado Springs - Airport is 9.6 mi from the Cheyenne Mountain Zoo and 12 mi from Manitou Springs. 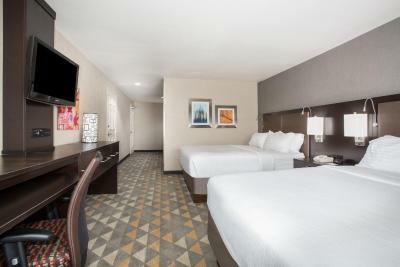 When would you like to stay at Holiday Inn Colorado Springs - Airport? Free WiFi, a flat-scree cable TV and a microwave and a refrigerator are offered in this room. A private bathroom is also included. Free WiFi, a flat-scree cable TV and a microwave and a refrigerator are offered in this room. 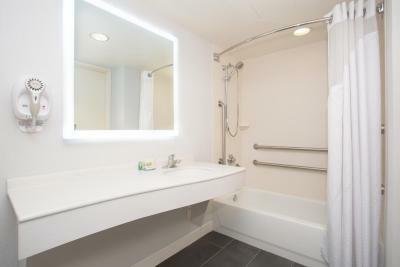 A private bathroom with a roll-in shower is also included. House Rules Holiday Inn Colorado Springs - Airport takes special requests – add in the next step! Holiday Inn Colorado Springs - Airport accepts these cards and reserves the right to temporarily hold an amount prior to arrival. Pricey like pop machine, small store also restaurant by hotel really $$$ No breakfast provide free I order veggie steamed and they give me bowl from veggies can yikes still $$ Not recommend go this restaurant. Nice room, clean and great pool. My husband and daughter arrived late and the receptionist told my husband that the reservation was no where to be found. He told her that he had confirmation but she kept maintaining there was not reservation. So as they were leaving the lobby to go elsewhere, (at midnight) only then did she tell them that there was a room available. Why didn't she say that upfront instead of arguing that his reservation could not be found? It was very frustrating for my husband as it had been a long travel day only to be greeted with less than stellar service. Not really close to shopping and dining. These were about 5 miles away. Great check in and out. I did not care for the pillows or the door in the bathroom that served both the toilet and vanity area. Keep hitting myself on it and my mom who is visually impaired had a very difficult time with it. Not far from the airport. Staff was nice to give us a room closer to the elevator as my mom has visual impairment. The only thing that I was concerned about was the heater it stayed running all night even when we had shut it off. If it wasn't so hot in the room I would have given a five star rating other than that our stay was excellent.